Do you know Japanese wind bell, furin? If don’t, please read the previous japanstyle article about furin. It’s a traditional wind bell that tinkles when wind blows. Strangely, the sound eases the heat, so it’s known as a summer thing in Japan. Today, since air conditioners take the place of furin, we don’t hear the sounds so often like back in old days; however, there is a furin performer who plays the furin as musical instulments. His name is YOSHIDA Shin and his stage name is “Kazaoto (wind sound)”. 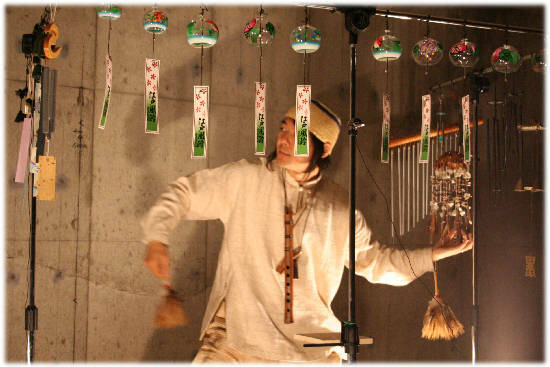 While he holds concerts at his furin house in Kanagawa, he performs in various places in the country. His activity has been featured on TV shows and newspapers. Mr. Yoshida always liked music; he started composing music since he was in junior high school. He used to play piano and synthesizer but he was thinking “something is missing in the sounds”. One day, he went to a concert and when he listened to a sound of a bell, he thought “this is it!” by intuition. Since then, he has released many CDs as a furin musician. Mr. Yoshida says furin makes “healing sounds” which can be enjoyed all year round. His dreams are, performs furin in all over the world, playing the furin with an orchestra, and having a New Year’s Eve concert on TV. How did you like the furin performance? Isn’t it beautiful? His CDs are available on his website, please visit it! It’s in Japanese, but please feel free to ask questions through JAPANstyle. Hi, as you maybe know, the Buddhists in Asia were the ones who developed windchimes to the fullest mostly because they used them in ceremonies. They hung windchimes to the rooftops of pagodas and temples that would ring deliriously whenever the wind came through. In Asia and the Mediterranean people believed that the windchimes would call to good spirits and they would come to protect the people who put them up. It was also believed that windchimes would keep evil spirits at bay. You can find windchimes on many residences in China and Japan the owners hoping the good spirits will protect them. In other cultures it is believed that windchimes will make you have good luck. Jennifer. You are right. It’s said Furin was originally used to keep evil spirits away in Japan. But for some reason, now it’s a summer thing here. Most people use furin just to enjoy the sound, while some others believe those spiritual effects. The web page you posted says “[wind chimes] will help tone down the negative energies in the home.” It makes sense to me because when I listen to the furin music, I feel negative minds go away. Thank you for sharing the interesting story and the website.